Whether you are planning to have an intimate wedding or an exorbitant one, Megarugas Banquet will surely match your unique choice, budget, and requirements. With a capacity of accommodating up to 100 in seating and 2500 in floating, the venue has a cosy and comfortable interior for the guests. It also offers an in-house team of caterers that puts all the efforts to delight the guests with mouth watering multi-cuisine dishes. Megarugas Banquet, Powai, Mumbai has hosted innumerable weddings and pre-wedding functions. Planning a larger event? Consider Sea Green, a lush expanse of lawn with connected wash-rooms for convenience. Megarugas Banquets, is a common venue for outdoor film shoots, weddings, awards' ceremonies and cultural events like Navratri. 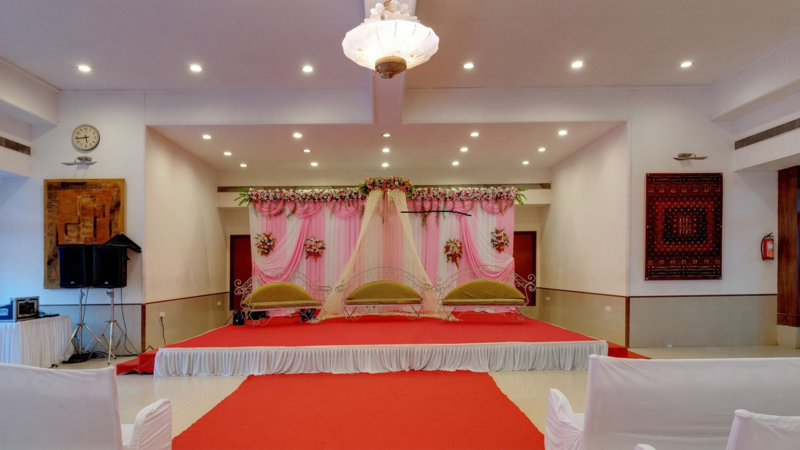 The venue also has banquet halls to help you with more options for having an indoor wedding or a reception ceremony. It is located at a close proximity from Chandivali Farm Road and Raheja Vihar Complex which makes it easily accessible for all. Megarugas, Powai has a sprawling lawn and an open sky that can accommodate a large gathering. The venue also offers complimentary changing rooms for the bride or the groom on their special day. It has multiple party areas which makes it easy to have different functions at the same venue. The elegant decor of Megarugas Banquet, Powai, Mumbai makes it an ideal option for a grand wedding.